Blane, G. (1785). Observations on the Diseases Incident to Seamen. London: J. Murray. Lind, J. (1753). A Treatise of the Scurvy, 1st ed. Edinburgh: Sands, Murray and Cochran for A. Kincaid and A Donaldson. Lind, J. (1757). 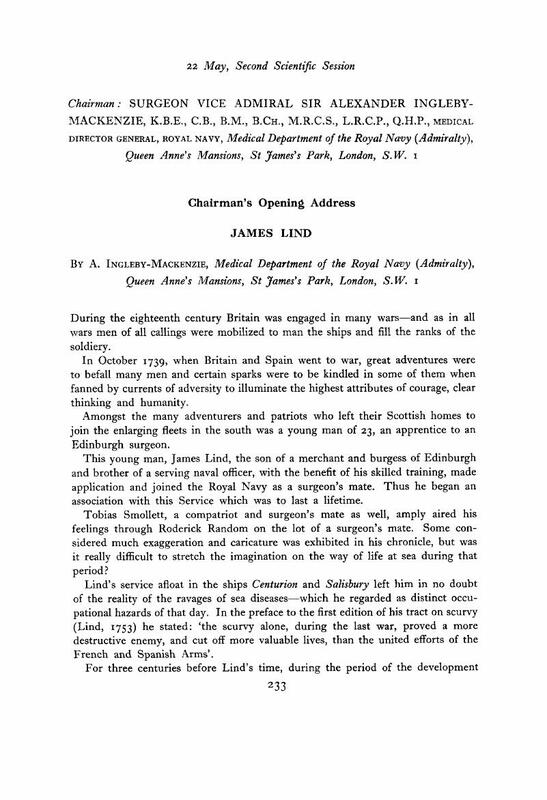 An Essay on the Most Effectual Means of Preserving the Health of Seamen in the Royal Navy. London: A. Millar. Lind, J. (1768). An Essay on Diseases Incidental to Europeans in Hot Climates. London: T. Becket and P. A. De Hondt. Simon, J. (1890). English Sanitary Institutions. London: Cassell and Co.